Futures prices reflect the price of the underlying physical commodity. Many futures have a mechanism for physical delivery. Therefore, a buyer of a futures contract has the right to stand for delivery of the commodity and a seller must be prepared to deliver on a short position if held to the delivery period. The vast percentage of futures contracts liquidate prior to the delivery period. Only a small number of these contracts go through the actual delivery process. Successful futures contracts depend on convergence, the process by which futures prices converge with physical prices at the expiration of the futures contract or delivery date. Consider the example of a farmer who is growing corn on his acreage. The farmer knows that the harvest of the corn crop will occur during the fall season. 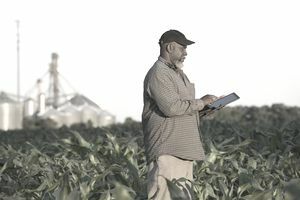 To protect price risk that farmer will often sell new crop futures contracts on the Chicago Board of Trade (CBOT) division of the Chicago Mercantile Exchange (CME). The December (new crop) corn futures contract will be the instrument used to hedge or lock in a price for the farmers' crop. Let's consider an example where the cash price for corn is $3.90 per bushel in the physical market. If the December futures price for corn is at $4.00 per bushel and the farmer sells futures the basis is 10 cents under (the difference between the physical price and the futures price for corn). The term under refers to the fact that the cash price is below the futures price at the time of the hedge transaction. When the basis is under, it means that the market is normal or in contango—there is no supply shortage. When the basis is over (the cash price is above the futures price) it means that the market is a premium market or is in backwardation—there is a supply shortage. When the farmer employs a hedging strategy such as the one described, the farmer exchanges price risk for basis risk. Basis risk is the risk that the differential between the cash price and the futures price diverges from one and other. Therefore, the farmer still has risk on his crop, not outright price risk but basis risk. The farmer has put on a short hedge by selling futures. The hedge creates a position where the farmer is now long the basis. If the cash price of the corn increases relative to the futures price, a condition of strengthening exists. This can be the result of the basis becoming more positive or less negative. In our example, a move from 10 cents under to 5 cents under would be a strengthening of the basis. This would result in a better economic result for the farmer. If the basis moved from 10 cents under to 15 cents under it would result in a worse economic result for the farmer. This is an example of a condition of weakening where the basis becomes more negative or less positive. When it finally comes time for the farmer to sell his corn crop in the physical market, the farmer closes the futures position. The farmer will buy back the short position that was the price hedge. If the differential between cash and futures (the basis) is 10 cents under when the transaction is completed, the hedge was perfect. If the basis is lower than 10 cents under, the farmer loses money on the basis hedge. If the basis is higher than 10 cents under, the farmer makes money on the basis hedge. Our example considered a farmer, a producer, but consumers who buy futures to hedge the future price risk of a commodity also exchange price risk for basis risk, only in the other direction. The farmer uses futures to protect against lower prices; the consumer uses futures to protect against higher prices. The consumer would buy futures, which is a long hedge. By virtue of the long hedge, the consumer would be short the basis. Therefore, the consumer has the opposite risk of the farmer. If the basis weakens, the consumer has a positive economic result due to the hedge and if it strengthens, the consumer has a negative economic result. Basis risk occurs when market participants use futures markets to hedge a purchase or sale that will take place at a later date. Basis tends to be a term used when referring to the agricultural markets. Basis has applications for all futures where a cash or a physical element is present for hedgers who can be either producers or consumers of a commodity.